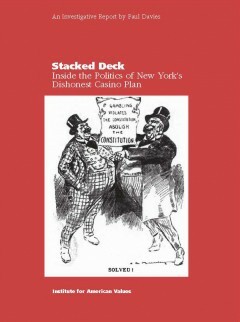 This is the inside story of how New York governor Andrew Cuomo, legislative leaders in Albany, and powerful gambling interests conspired to undo the New York State Constitution in order to legalize Las Vegas-style commercial casinos in the Empire State. Despite a promise to change the corrupt culture in Albany, much of the political process led by Cuomo has occurred behind closed doors, influenced by an army of gambling industry lobbyists and millions of dollars in campaign contributions. As a result, voters are now being asked to approve a major public policy initiative without knowing the true economic and social costs of more gambling, let alone where the casinos will be located. Paul Davies is the Maggie Walker Fellow at the Institute for American Values, where he edits the blog GetGovernmentOutofGambling.org. Davies is a journalist who has worked at the Wall Street Journal, Worth magazine, the Philadelphia Inquirer, and the Philadelphia Daily News as well as newspapers in Connecticut, Florida, and Maryland. A series of editorials he wrote on casino gambling at the Inquirer was nominated for a Pulitzer Prize in 2009. An investigative series on predatory lending he wrote at the Daily News was a finalist for a Gerald Loeb Award. Davies received a bachelors degree from the University of Delaware and a masters in journalism from Columbia University, where he was also a Knight-Bagehot Fellow.